St. Louis took a 2-0 lead midway through the first period with goals from Ivan Barbashev and Ryan O’Reilly. Nick Bonino cut the lead in half scoring on a power-play goal for the 2-1 score, but Brayden Schenn put St. Louis up by two with a goal at 15:09 of the first period. Zach Sanford extended the St. Louis lead to 4-1 with a wrist shot at :36 of the second period, and the rout was on. Robby Fabbri made it 5-1 and the Predators pulled starting goalie, Juuse Saros and replaced him with Pekka Rinne. 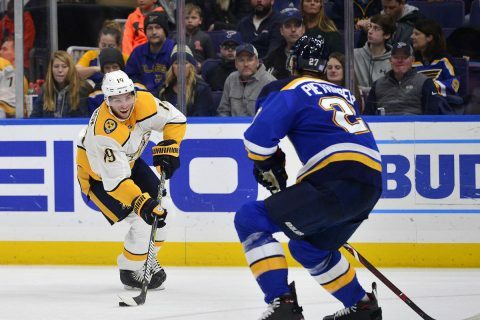 Alex Pietrangelo would make it 6-1 at 14:50 of the third period and one final goal from the Predators’ Ryan Hartman at 16:13 of the final frame and that would be your final score, 6-2. In his post-game interview, coach Peter Laviolette said his team made too many mistakes early in the game and they needed to be corrected before they hit the ice on Sunday night against Anaheim. 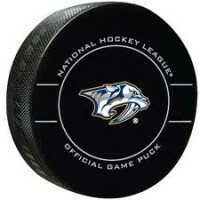 The loss snaps Nashville’s three game win streak, and 0-3-1 in their last four road games.